Non-surgical spinal decompression therapy as performed in our office is a very high-tech form of traction. It is a highly successful, non-surgical alternative procedure for relieving low back, neck, and arm and leg pain. Decompression Therapy is a modern, high tech, non-surgical traction procedure that effectively treats disabling low back, neck, and radiating leg and arm pain. This type of traction is very successful in relieving pain associated with disc herniation, degenerative discs, and posterior facet syndromes, due to decompression of spinal discs and facet joints by utilizing traction, distraction and positioning. This therapy effectively enhances the healing process and renders quick, effective and amazing pain relief that enables most patients to return to a more active lifestyle. Research to develop this procedure was conducted by prominent physicians, engineers and technicians at major teaching hospitals. Do you have a herniated disc, multiple herniated discs, degenerative disc disease, facet syndrome? Is your doctor suggesting surgery, pain management, or physical therapy? Our DTS Triton traction system is FDA approved and has been clinically proven with a very high success rate for the pain and symptoms associated with herniated and/or bulging discs…even after failed back surgery. Research indicates that the disc is responsible for a significant number of lumbar/leg pain and neck/arm pain syndromes. Compression increases internal disc pressure leading to possible protrusion, herniation and bulging of disc material. DTS Triton spinal traction therapy in conjunction with the additional treatment modalities provided in our clinic can, in most cases, effectively relieve the pain and disability resulting from disc injury and degeneration, aiding in the healing of damaged discs and reversing dystrophic changes in nerves. DTS Triton spinal traction treats the functional and mechanical aspects of disc pain through non-surgical traction (decompression) of spinal discs. Clinical studies verify the significant reduction of internal disc pressures which result in the non-surgical traction of the disc and nerve root. Older, conventional traction has never demonstrated a reduction of this internal disc pressure; on the contrary – many older traction devices actually increased internal disc pressure, most likely due to reflex muscle spasm. Our new computer controlled DTS Triton spinal traction equipment is designed to apply distraction and decompression to the patient’s spine without producing reflex paravertebral muscle contractions. By significantly reducing internal disc pressure, DTS Triton spinal traction promotes retraction of the herniation back into the disc and promotes intake of fluids, oxygen and other substances necessary for healing the disc. This activity stimulates repair and inhibits leakage of materials from the nucleus of the disc. The most recent research trial sought to correlate clinical success with MRI evidence of disc repair as a result of such treatment and found that reduction of disc herniation ranged between 10% and 90% depending on the number of sessions performed, while disc annulus healing was evident in all cases. After lying on the comfortable DTS Triton spinal treatment table, you will be fitted with a support system. The support system helps to stabilize your body. The advanced computer controlled system automatically adjusts to the proper angle of pull (distraction), allowing us to target the specific discs that are causing your pain and symptoms. The distractive forces utilize a computer controlled logarithmic curve to avoid reflex responses which would create muscle spasm. The split table design decreases friction and allows separation of the vertebra. 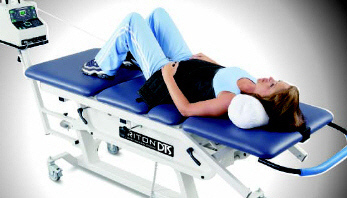 Basically, you lay down on the table and the DTS Triton spinal traction computer system simulates an anti-gravity effect on your spine that helps herniated material return toward its normal position thus reducing pressure and pain. Patients describe the treatment as a gentle, painless, intermittent pulling sensation. Many patients actually fall asleep during treatment! Patients typically undergo 15 to 20 treatment sessions. This, of course, depends on your individual case and is determined by thorough pre-treatment evaluation. Following each session, a cold pack and electric muscle stimulation/sedation is usually applied to speed the healing process. It is important to note that many patients get substantial, immediate relief after just a few treatments. Some have significant reduction of pain after just one session. The really good news is that this is not something you have to continue to do for the rest of your life! So it is not a big commitment. Can DTS Triton Spinal Therapy Help My Pain? Though each patient is different and no doctor can guarantee success, the clinical results of this type of therapy have been shown to be effective in 86% of patients treated. The common problems of many back conditions are damaged discs and poor spinal muscle control. Our treatment program addresses both of these core problems. The specially designed DTS Triton spinal traction system creates a controlled unloading of the spine which appears to decrease disc pressure thus increasing blood and nutrient exchange. This exchange of fluids is something the damaged disc desperately needs to help it heal from the inside out. Muscle strength, control and endurance can all be improved with our spinal therapy program that includes specific controlled spinal exercises. Will DTS Triton Spinal Treatments Hurt? Is it Safe? DTS Triton Spinal Traction Therapy treatments are one of the most gentle and comfortable therapies available. The treatments utilize FDA cleared equipment with proven safety and efficacy. Most patients report a mild sense of stretch on their back or hips, and often fall asleep during treatment sessions. The DTS Triton system is produced by one of the world’s largest manufacturers of hospital based therapy and rehabilitation equipment. Although traction therapy has been around for thousands of years, DTS Triton computerized spinal traction therapy is new. Advances in equipment and procedures have dramatically improved effectiveness. This system is the most comprehensive program available, allowing the safe delivery of this previously hospital based therapy in our office. Continual improvements in the delivery system and regular updates in protocol keep this system in the forefront of non-invasive disc therapy. Each year over 50,000 patients are treated with this type of therapy and that number is growing. This depends on the complexity and extent of the treatment and rehabilitation needed, however we typically treat 2-3 times a week for 4-6 weeks, transitioning from passive to active treatments as you respond. The treatment is administered over a reasonable timeframe and your response is continually evaluated. Further treatments may be necessary or a reduced frequency may be recommended at that time. The rehabilitative phase may include additional DTS Triton spinal traction treatments coupled with special exercises, spinal manipulation and adjustments to enhance the results. Most patents are released from treatments after 6 to 12 weeks. • In some cases surgery is necessary, more often it is not necessary. • Increased danger from anesthetic. • Increased danger from possible infections. • Prolonged recovery time after back surgery is generally 6-8 weeks. • Another 6-8 weeks of rehabilitation and physical therapy at 3-5 times/week. • Lower rate of successful results. • Without insurance patient’s cost for surgery is often over $25,000. • Even with insurance, patient’s surgical cost is often over $4000-$5000. • Relief of acute or chronic (long term) low back pain and/or associated leg pain or numbness, generally within 4 weeks. • Successful in over 75% to 85% of patients. • Early return to work. • Non-invasive and extremely safe. Along with the damage in the disc, we also need to treat the supporting spinal muscles. A complete program targeting the function of the stabilization muscles of the spine is a vital part of spinal decompression therapy. Heat, muscle stimulation, and ultrasonic therapy can offer additional benefits for inflammation and spasm reduction. Our goal is to not only to help heal the disc but enhance muscle control and support of the low back. A gradual breakdown of the foundational support of your back is what puts undue stresses on the discs and leads to disc degeneration, pain and loss of function. Our program of spinal exercise and adjunctive therapies will assist in rehabilitating these structures. Although it is difficult to predict the future, experience has shown that most patients do find long-term relief or effective management of their pain when they complete the entire recommended program of treatments. Regular home exercise and periodic visits to our clinic will help in maintaining your spinal health and reduce the probability of reoccurrence. As with any comprehensive rehabilitation program, your continued home care exercises and discretion in some daily activities is the key to long-term relief. The cost varies depending on your condition and the extent of care needed. (See above for comparison with cost of surgery.) We promise to only do those procedures necessary for your fullest recovery. You always have the choice as to the extent of care. Our staff will review all costs, payment options and insurance coverage before treatment begins. We want to help and we believe finances shouldn’t stand in the way of your good health. How is Spinal Decompression different from older type traction? Older type traction is a simple steady force that is put on the patient’s body with the intent of unloading the body’s joints, muscles and other structures. For example, hanging upside-down is a common method to put the spine into traction. Rather than one’s body weight putting stress on the spine, which is what happens when standing erect; the body weight is working to unload the spine. Various forms of traction have been around for over 1000 years; however, pain relief has been inconsistent and short-lived until now. In fact, several clinical studies have shown ordinary (old type, steady pull) traction to be an ineffective form of back and neck pain relief. The reason is unexpected, but pretty simple. Our bodies react to the steady pull of the traction on the spine by contracting, or squeezing, the muscles surrounding the spine. Rather than achieving the desired effect of unloading the spine, the pressure on the spine is actually increased, thus increasing intradiscal pressure. Thus this old type of traction does NOT allow the discs to re-hydrate and heal, which is what ultimately yields pain relief. DTS Triton Spinal Traction, on the other hand, is a modern, computerized, updated form of traction. Computer technology is used to control variations in the unloading (traction pull) of the spine, effectively avoiding the body’s muscle contraction response. Notice in the figure below that the traction tension is varied over time according to the graph. The doctor can control how many progressive tension steps are experienced by the patient before reaching the maximum tension. The doctor also has complete control over how long the tensions are held steady and how often they are repeated through the computerized system.